In my first New York public relations job, one of my tasks was to sort and tally the stacks of client publicity clips that came in from the clipping service. That’s right, kids, there were actual newspaper or magazine cuttings, each bearing a white tag that listed where and when the item appeared. My fingers would be newsprint-grimy within an hour. That was how we measured the PR team’s performance – by counting the publicity clips our work generated. Fast-forward a couple of decades, and the PR industry has grown far larger and more sophisticated. Our program strategies are more likely to be informed by behavioral data. We use social media listening tools, review market research, and create SEO-enhanced content. But when it comes to measuring the value of an investment in public relations, in many ways, we’re still counting clips. There’s nothing wrong with quantifying publicity. Earned media placements are usually at the top of a client’s wish list. At my agency, we generate a great deal of earned media for clients, and even after all these years, it still feels like magic when a great story hits. But despite the thrill of strong publicity results, most clients need more objective ways of evaluating the return on their PR investment. What is that interview or profile actually worth? And how to measure the other activities that a PR group delivers? The absence of a standard formula for measuring PR success remains our holy-grail challenge as an industry. For years, the PR industry’s response to the problem was to measure outcomes by treating earned media stories as paid advertising, with a dollar value calculated from standard ad rates. The ad equivalent formula was popular with marketers because it translated PR output into something familiar – advertising! But the problems with AVE (Advertising Value Equivalent) are obvious. Measuring earned media as if it were paid advertising is a little like using a map of Arizona to navigate Nevada. It’s just not the same thing. For more about AVE and the industry’s response, see this post for marketing group MENG on how marketers should evaluate PR programs. The short version of the PR industry’s evolution is that six years ago it created the Barcelona Principles, a set of seven voluntary guidelines to measure the efficacy of PR campaigns. The principles aren’t a magic formula for measuring earned media, but they help refute the AVE standard and are useful as a guide. 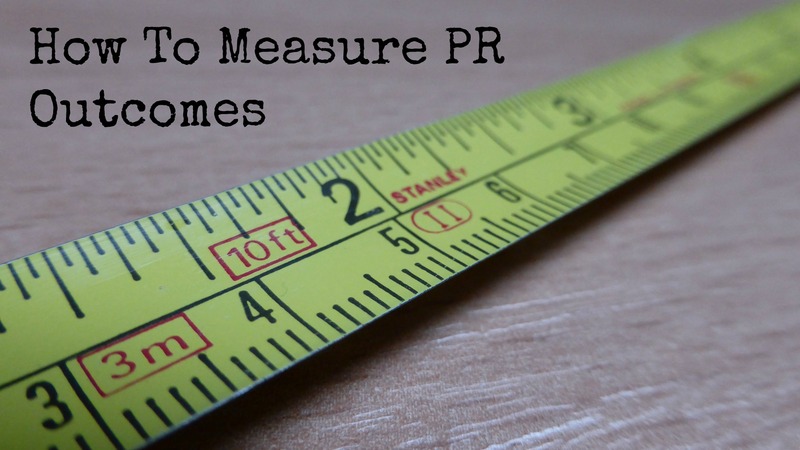 So, how should we measure PR outcomes? The methods will vary with individual business goals and needs, but most clients can’t afford to do matrix-mix modeling or complex studies. Here are my real-world guidelines for PR professionals. Set a budget for measurement. This is obvious, but it’s surprising how often measurement is not considered when the PR budget is finalized. And it’s usually for a good reason; market research can be costly. Some evaluation tools are either too narrow in what they do, overpriced, or both, so a mix of paid and free tools is generally best. PRSA recommends that 5% of a given PR budget we reserved for measurement, which is a reasonable figure and one that should be feasible for just about any program. Benchmark awareness first. It’s hard to measure progress toward goals if you don’t have a baseline. In my view, every PR program should start with a baseline audit of a brand’s media visibility, including searchable content about brand attributes, customer complaints, reviews, and earned media coverage. If favorability versus competitors is a goal, then the audit should obviously include competitive brands as well. A brand audit is also effective for informing PR messaging and even tactics, so it’s a win-win for everyone. Depending on the size of the brand in question, an audit can be performed very cost effectively. Consider other key awareness indicators for benchmarking. Within the broad label of “awareness” it’s helpful to break down specific variables like reach (as measured by impressions), marketing message delivery, and the social sharing that can amplify the impact of earned media. Most social mentions can be evaluated with the analytics already embedded in major social platforms, or with specially designed tools for social media monitoring and evaluation. None of these criteria stand alone, and some are even arguable, but in aggregate they are powerful, and the most important factor is an apples-to-apples comparison over time. Track earned media against web analytics. Most of our clients do this already, but there are cases where the PR team isn’t informed about what’s actually driving site traffic or conversions, so communication here is key. Then, too, not every program has the goal of producing web traffic. A campaign to build awareness for a new craft beer probably wants to drive beer lovers into stores or bars. A health promotion campaign may seek to get people to stop smoking or cut saturated fat consumption. In cases like these, tracking web searches, coupled with awareness surveys, are more effective than site analytics. Measure what is most relevant. We’ve all experienced the PR relationship where you spend more time tracking and measuring than you do talking to media or creating results. To avoid that, focus on what is truly important. Some clients will count clips, but it may be more useful to analyze the message pull-through in the earned media generated by a PR campaign. Or it may make more sense for B2B brands to invest the measurement budget in a study that gauges brand preference in a given customer segment, or corporate reputation lift over time. There isn’t a one-size-fits-all formula for measuring PR success. But with a modest investment of time and budget before the campaign, and an agreement on methods that measure what PR truly does well, we can all be more successful in what we do.